Please feel free to search and browse our FAQ's. If you require more detailed buying guides to product groups, please see our Buyer's Guide. To provide a protected power energy network system with both lightning and surge suppression, many points must be taken into consideration. But before we explore these phenomena and their protective mechanics, we must understand the basic principles of lightning and its creation. Thunderstorms develop when ground heat creates a hot rising current of air, this air gradually cools until it condenses into small cumulus clouds. The cumulus continues to grow vertically, until it eventually becomes a storm cloud or cumulonimbus. This atmospheric phenomenon leads to the creation of electrical charges resulting from collisions between water, hail and ice particles of varying sizes. The cloud or cumulonimbus has now become a split cell system, forming a negative charge at the base of the cloud and positive charge at the top. The centre of the negative charge is usually at the base of the cloud due to the movement of electrons through the heavier droplets and hailstones. While the centre of the positive charge moves up the top of the cloud carried by convection currents, which can easily lift the light positively charged particles. The effect produces a similar change at the earth’s surface due to charge repulsion of around the same magnitude, but opposite polarity. The potential inside the cloud is usually around several million volts and the electrical field may even exceed 5kV/m at ground level, which has the ability to create upward leaders rising from surface irregularities or metallic structures. At this point, the electrical field is so strong that small discharges are produced from the cloud known as step leaders. As these step leaders get closer to the ground level, the upward leaders rise up to meet them. When the step leader and the upward leader meet, the circuit is complete, creating a short circuit, the lightning strike, with a discharge current from 10,000 amps to 200,000 amps. The energy from a lightning strike can very easily reach 20GW. The most common strikes are from cloud to ground (in 80% of lightning strikes) and are usually negative discharges, but when the discharge is positive in the downward direction, the intensity is extremely high. At this point there is an imminent discharge of energy with the electrons now looking for earth, and this is usually found on the corner of buildings, antenna masts, radio equipment mast, pylons and many other structures. What are the parameters of Electronic Lightning & Surge Arresters? Type 1 device 10/350(µs) should be installed in Lightning Protection Zone 1 (First point of entry into a building off the grid). Type 2 device 8/20(µs) should be installed in Lightning Protection Zone 2 (sub distribution panel boards) where sensitive electronic equipment and power distribution is critical for the continuation of services. 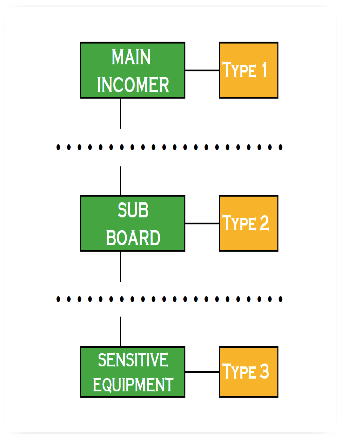 Type 3 device 8/20 1.2/50(µs) should be installed in Lighting Protection Zone 3 (at the final end circuits) and is critical in preventing damage to items such as file servers, data communication systems, sensitive computer interfaces, CCTV, BMS systems and similar. How do I know which is the correct surge protection device? FPSP Ltd does not provide a set of rules and guides to support a correct design of the protection system according to the application. However we follow the UK lightning and surge protection standards to BSEN62305. With this in mind we provide a cascaded system as laid down in the rules of the standard, not the rules of FPSP LTD. In the field of industrial applications, a standard practice is to install a cascaded protection system based on several coordinated protective devices installed at different stages (LPZ’s). The benefit of this strategy is the fact that it allows a high discharge capacity close to the installation entrance along with a low residual voltage (level of protection) at the main incomer of installation of sensitive equipment. The design of such a protective system is, amongst other factors, based on the assessment of information such as existence of a lightning rod (Lightning Protection System) and type of incoming power supply lines, secondary primary equipment and data systems. The solutions provide protection against either Transient or Permanent (TOV) overvoltages or against both of them (T+P) simultaneously. The final product choice depends on parameters such as: type of installation, type of network disconnection (operation on MCB or RCD), autoreclosing, breaking capacity, etc. Please check our website for further information and download our catalogues and documentation. If you require further in-depth information or a design please contact us directly. What is the least amount of devices I can install to comply with the standard? In short any cable that leaves a building can return transient back into the building (with the exception of Fibre optic). Without the correct type of arrester being installed the system will fail and the Duty of Care and Due Diligence will not have been exercised. Consequently any insurance company will probably negate your claim. What if the panel builder has inbuilt a SPD into my panels? If I install a Type 1 lightning arrester on the mains will it be sufficient? It’s a huge misconception that installing one Type 1 lightning arrester on the mains is sufficient, it simply is not. To comply with the current UK lightning and surge protection standard, a full survey must be completed and an investigation of all the power lines and data lines. Should I be worried about Far Eastern equipment? Alarmingly! We have seen a huge amount of dangerous products flooding the UK not only from the Far East, we have access to laboratory therefore we test many of them and some meet the claims on the packaging……….others seriously don’t. We have been made aware of a company in the UK that imports product of a questionable quality from a dubious source we have tested these units to the IEC performance specification and they have been found seriously wanting in quality and robustness. In short we had to stop the test due to failure of the unit in the early stages of the test. All our devices carry a ten year warranty. How do I protect PV array (photovoltaic’s)? The inverter is the primary point in need of protection, a T1 lightning arrester is able to protect against a direct lightning impulse from the array and this should be coupled with a T2 surge arresters for overvoltage, without this protection the entire system will be in jeopardy as the over current will continue to flow into the power network destroying other systems. Ideally an external strike point would be the best application, typically a ESE on the roof of the building and a T1 & T2 lightning and surge arrester on the inverter. How do I install the surge protection device? Every CPT Protector is supplied with a product sheet that contains a comprehensive description of the installation procedure. The sheet is to be found within the same package as the product. Or in the case of a pre-installed systems it will be inside the enclosure. Installation of the surge arrester is very simple for the power systems and even easier for the data units, generally the power protection devices are installed in parallel following a fuse selection and installation, the unit should be more than half a metre from the equipment to be protected. All data protection devices are wired in series and these for the most part do not need an electrician to install them. CPT products for combined protection against both Transient and Permanent (TOV) overvoltage’s are usually connected parallel to the existing electrical installation, downstream of the MCCB and with earth connection. The V-CHECK 2D and V-CHECK 4D series do however not follow this rule as they have to be installed downstream of the RCD. If in any doubt please call us and we will be more than happy discuss this with you. Which cross section should I use to wire the CPT surge protection device? Cirprotec strongly encourages the customer to use the largest feasible cross section as this enhances the performance of the surge arrestor while diverting to ground. This will in turn mean a lower residual voltage. Note that the largest feasible section is determined by the section of the terminals themselves, with a typical value of 35mm. When using wire cross sections below this value, the minimum value should be 6mm. How do I know whether the surge protection device has been properly installed? All of the protection devices have visual indication of the front see through panels, quote simply its green/black for OK or the window will show RED when the device has failed. Most of Cirptotec's Transient, Permanent and combined (T+P) surge protective devices have a TEST button. It is also strongly recommended to check the product installation sheet for correct wiring of the protective device. When and why is it necessary to install a back-up fuse upstream of the surge protection device? Due to their very nature, surge protective devices may achieve their end of life status (end of life cycle) after having been required to divert a severe overvoltage or a certain number of them. This is a totally normal behavior. When this happens, the built-in thermal switch of the CPT product will disconnect the device from the installation. There is always a risk that a very severe overvoltage will cause the varistors to short-circuit. The associated fuse will then have to protect the installation by disconnecting the surge protective device from the network. If the nominal current of the general fuse is higher than a certain rated value (which will depend on the type and model of the surge protective device), it will be necessary to install an additional fuse, a back-up fuse, in order to assure correct protection. What are the effects of Lightning - LEMP - Lightning Electromagnetic Pulse – 200,000 amps? The effects of lightning are classified as direct when the result of an impact of a lightning strike hits a structure and is carried into the building on the earthing systems, or indeed in the case of many buildings, into a BS 6651 lightning protection system that has been cross-bonded to the external lightning protection. The new standard, which has replaced the old BS 6651 for new buildings and installations, is harmonised with European standards. This sets parameters across the EU with a set lightning flash discharge value of 200,000 amps (20kA) and a waveshape of 10/350(µs). Bonding and Earthing and their ability to Carry a 200,000 amp charge from a lightning strike. The old standard BS 6651 was designed around an earthing system when the requirement was simply to protect the external fabric of the building in a safe and controlled manner, with little or no damage to the building. This system has been used for many years to control lightning strikes. The system, known as a Faraday cage or mesh cage system, may even utilise the reinforcement bars of the building for earthing and cross bonding. However, the old 16th edition regulations and new 17th edition, emphasise that every item that carries current or is manufactured from metal will require an earth cross bond to prevent potential rise in the building. What is the BSEN62305 standard? The BSEN62305 is a new raft of standards that was introduced in the UK way back 2006, the standard ran in parallel with the now obsolete standard BS6651. This carried on until the first of September 2008 and the old standard BS6651 was removed giving full birth to the now current BSEN62305. This is an extremely complex and exacting standard and cannot be as simply deployed as a system designed to BS 6651. The stipulations for the design process are very rigorous and the responsibility upon the designer is very high. If any part of this system is missed, poorly designed, cut, removed or simply not utilised then the designer / installer / client will be held responsible under the primary R-values. The BS EN 62305 series outlines the general technical aspects of lightning, illustrating its principal electrical, thermal and mechanical effects. Guidance is given on how to assess the risk of being struck and how to compile an index figure as an aid to deciding whether a particular structure is in need of protection. The guidance given is of a general nature and its application to specific lightning protection installations has to take into account the particular conditions pertaining to those installations. In cases of difficulty, specialist advice should be sought. This is the most important part of the standard, as it outlines the risk management approach, the results of which dictate which level of lightning protection system is required. It is therefore vital to provide as much information as possible to enable this risk assessment to be carried out correctly. Using the latest risk assessment software, the contractor will carry out a series of calculations to determine which, (if any) level of protection is required. This is critical to the overall design as the design will need to address many of the points raised from the risk assessment, as shown below. Part 3 of the standard relates to the design and installation of the lightning protection system. Once the protection level has been calculated following the risk assessment, the basis of the design will be taken from information shown in the table below. Type A – Vertical earth electrodes, solid copper plates or lattice mats. Type B – Ring earth electrode around the perimeter of the building. Part 4 takes into account the electronic and electrical devices inside of the structure. .BS 6651 contained annex C, which only recommended the use of surge protection devices whereas BS EN 62305 makes it compulsory for surge protection devices to be fitted as an integral part of the lightning protection system. Again, the type and location of the SPDs are determined from the results of the risk assessment. The contractor shall deploy a risk assessment to this standard and submit a design on the principles laid down in this standard. What are the Specification guidelines for Lightning Protection? Code of practice for the design of systems for the protection of structures against lightning. This British Standard provides guidance on the design of systems for the protection of structures against lightning and on the selection of materials. Recommendations are made for special cases such as explosives stores and temporary structures, e.g. cranes and spectator stands constructed of metal scaffolding. Guidance is also provided on the protection of electronically stored data. This British Standard outlines the general technical aspects of lightning, illustrating its principal electrical, thermal and mechanical effects. Guidance is provided on how to assess the risk of being struck and how to compile an index figure as an aid to deciding whether a particular structure is in need of protection. The guidance provided is of a general nature and its application to specific lightning protection installations has to take into account the particular conditions pertaining to those installations. In cases of difficulty, specialist advice should be sought. The principle informing the provisions of this British Standard is that of the “Faraday cage” form of lightning protection, and installations employing alternative technologies fall outside the scope of this British Standard. (Protection of offshore oil and gas installations does not fall within the scope of this British Standard). What is the primary role of this British Standard and the design process? The primary role is to protect the fabric of the building and ensure that no damage to the side walls or puncture to the roof of the building will occur, and generally that the entire fabric of the building will not experience damage by utilising a Faraday cage network system or that the metalwork of the building will not be damaged by cross bonding at the base. (An awareness of the potential issues with ingress of lightning from the cross bonded equipotential bonding zone should be declared. This bonding zone cross bonds the external lightning protection to the internal earth bar where the common earth is located. This standard makes recommendations for protection at this point but it is not compulsory). Can an ESE be used in a BSEN62305 SYSTEM? An ESE cannot be utilized in a BSEN62305 system, it can be installed as part of the building protection in a BSEN design but only its physical dimensions can be taken as part of the protection system. FPSP Ltd offer a unique systems as below, this is a very cost effective solution over traditional systems. To be used on old buildings requiring protection. If part 4 is deployed from BS EN 62305, this can be signed to the new standard providing that the external system is certified to BS 6651 which is equal to Level 3 on the new standard. The design process for this system can only be utilised on a BS 6651 building and can form a BS EN 62305 design. This is to protect the fabric of the building and to ensure that no damage to the side walls, roof or the metalwork of the building is experienced by the use of a Faraday cage network system . To conform to the parameters of part 4 of the standard covering all service line entries into and out of the building, the minimum level of protection will be to provide electronic lightning and surge arresters for the mains panel board and any external lighting boards which could bring energy into the building around the mains protection. These are to be identified and protection provided. What is an ESE (Early Streamer Emission)? What are the main benefits of a Nimbus Lightning Rod with Early Streamer Emission (ESE)? What standards do the ESE meet? What are the requirements for design and installation of the ESE system? Design and confirmation of this system will be provided by First Power & Surge Protection Ltd.
What happens if we receive a Strike to the Overhead Power Cables? 200,000 amps direct into the transformer and on into the building’s main panel MCCB board, will continue into and throughout the building destroying systems and computer architecture, BMS, fire alarm panels, burglar alarms, radio communications and will cause the building to cease functioning for its primary role. What is an induced voltage Cloud-to-Cloudburst? Induced voltage typically onto the power cables can create anything in excess of 100,000 amps. This is then carried by the power cables into the building directly on the phase side and destroys equipment. What happens if the building receives a direct impact to the Faraday Cage and Cross Bonding? This system has a secondary negative effect, at the point the rebar or Faraday cage is cross-bonded to the centralised earthing system. This cross coupling, if it is not on the equipotential bonding zone, may have been fitted on the wall directly adjacent to the main panel board (or even located inside the mains panel board) which will allow a lightning strike to enter onto the main earth bar with potentially catastrophic results: There is the danger of lightning strikes entering into the building on the centralised earth with free and uncontrolled access to every part of the integrated earth within the entire power network system and uninterrupted passage to any device that is connected to it, typically sensitive data processors, communications systems, and CCTV networks causing the building to cease functioning for its primary role. What is an Indirect Lightning Strike – Ground Strike Transients? The power discharge of a direct strike to ground will enter into a building via the cross bonds of other buildings, metal pipes, gas, electric and other means. These electromagnetic currents which have been generated during its discharge to ground, will be seen up to 2 kilometres away and can enter in to the buildings’ delicate systems, usually fire alarms, burglar alarms, BMS systems, CCTV file servers and telecoms systems amongst many others. This problem presents itself usually in the most vulnerable systems, telecoms, and radio equipment, as these tend to be more delicate as they use more motherboard technology, which is very easily destroyed. Usually the point of entry is not seen, just the sudden cease of operation of equipment. These are very high (kV) voltage peaks of very short duration (µs) caused by a lightning strike or power network switching. Its smaller partner, an 8/20(µs) is generated internally via switching events, some examples of this are lift motors, welding machines, hand driers, large load lighting, high power inrush motors and generators. On energising the motors via, for example, their star or delta wiring configuration, an inrush of 25 times the normal operating value of a motor’s rated system could occur to energise the equipment for half a second. On fall back to the normal operating value, the resultant over voltage is seen on the network as a spike, a surge, an anomaly, a glitch; however these anomalies or surge events, cause a huge amount of erosion damage in computer systems and sensitive data storage devices. This problem can result in sudden failure with no real apparent reason for the failure and downtime leaving the service off line and requiring costly repairs.. In the event of a lightning strike / surge event, it is the cost of down time when systems are off line and the danger that this poses to individuals, especially where critical data, life support systems, telecommunications systems and public responders require a continuity of service, that results in the biggest cost to any operation. Avoidance requires the careful protection of delicate instrumentation, computer systems and other forms of data carrier to ensure that confidential data is secure, operational functionality is retained, individuals are not at risk and downtime is minimised. These 8/20(µs) are mostly internally generated, although many of these levels of over voltage are received from the grid. Consideration must also be given to let-through volts from a direct lightning strike. Not only will a surge find its way to very sensitive equipment, it will be seen by any common switchboard and transmitted into every part of the power network. The demand on the UK network is very high and as a result there are switching discharges onto the grid from many areas. These are becoming more of a problem as the grid network becomes more intensely used. As you can see from the above, BS EN 62305:2006 is a complex new standard as is the methodology of protection to ensure continuity of services in any situation. Extensive planning and risk assessments have to be performed, not only relating to the way the power is managed but also regarding the checking of cross bonding on buildings and “zoning” off of any areas where energy can re-enter a building. The building systems are only as good as the contingency planning that has been performed on them and to fail to make adequate provisions in this area or to fail to embrace the protection system mindset, is simply inviting catastrophe. It is difficult to imagine the disastrous situation that would arise if any of the contingency emergency services were brought to a halt by these hidden dangerous scenarios. Last year alone the UK experienced 18,000 + lightning strikes. The magnitude of energy is such that once hit, systems are usually destroyed beyond reasonable cost efficient repair. If this is a communications system, then all of the networked PCs along with every other aspect of the system will be damaged. CCTV provides additional problems to consider, as most systems will be interfacing via a file server or multiplexer and when this is hit, the system simply passes the energy back into the building affecting other systems and causing failure. What is the selection process for Surge Protection Devices (SPD) under BSEN62305? According to IEC standards, depending on the installation's exposure to surges, protectors of different discharge capacities will be required. Another point to be taken into consideration when selecting a SPD is the equipment to be protected, as the level of protection (residual voltage) provided by the protector must be less than the value the equipment can withstand. SPD capable of shunting high currents in waveform 10/350 µs. High Protection level (Up). These protectors must be installed at the main incomer where the highest level of exposure to over voltages can be expected, providing a level of protection compatible with the equipment installed on it. SPD capable of shunting high currents in waveform 8/20 µs. Medium protection level (Up). These are the most widely used as they provide a level of protection compatible with most equipment connected to the electrical network. Its use is appropriate for medium protection where Type 1 surge protectors are installed as a first step in homes, shops, and similar. Type 2 SPD must always be installed downstream of Type 1 SPD in all installations with LPS, in the low voltage switchboard. Installing it at the main incomer will be sufficient where the distance from an installation with an external protection is less than 50 m.
SPD capable of shunting high currents in waveform 8/20 µs. Low protection level (Up). Must be installed to protect sensitive equipment for individuals and industrial equipment, and for equipment over 20 m. away from where the Type 2 SPD is installed. Our SPD are based on varistor (MOV), gas discharge tube and spark gap technologies, and a combination of these, depending on the discharge capacity required. The ideal method is to provide protection in steps, using different types of protector and selecting the devices best suited to the installation. Our surge protectors are manufactured in accordance with IEC-61643-1, NFC 61-740, BS 6651 and DIN VDE 0675-6 standards. What is the working principle of an SPD? An SPD acts as a voltage-controlled switch. When the voltage is less than the nominal voltage, the SPD acts as an infinite impedance element, and when the voltage is higher than the nominal value, it acts as a zero impedance element, shunting the excess voltage to ground. The FPSP Ltd family of surge arresters includes a full range of compact protectors for installation on a DIN rail. The range is specially designed to provide complete and effective protection against surges, protecting equipment and property connected to the low voltage network. What is the - [UP] Level of Protection? This is the parameter that characterises the action of the protection device against surges by limiting the voltage between its terminals. It must be less than the surge withstand capacity given by the category of the equipment to be protected. However, if the surge protector is at a distance from the equipment to be protected it may be necessary to use additional protectors. What is the - [Iimp] Impulse Current? This is the peak current that the SPD can withstand without failing. The waveform of the applied current is normalised as 10/350 µs. Used in Class I SPDs. What is the - [Uc] Maximum Continuous Operating Voltage? This is the maximum RMS or DC voltage which may be continuously applied to the terminals of the SPD. What is the - [In] Nominal Discharge Current? This is the current that the SPD is capable of shunting to ground at least 20 times without failing. What is [IR] Remote Indication? Models with remote indication (IR) have a voltage-free contact for remote signaling of the end of the ligntning and/or surge protector's useful life. What are Overvoltage propagation paths? There are two paths for the propagation of transient over voltages. The first one is Common Mode propagation (or asymmetrical). This occurs when the electrical disturbance takes place between the active conductors and ground (phase-to-earth and/or neutral-to-earth), with risk of dielectric perforation. The second type of propagation is called Differential Mode (symmetrical). The disturbance takes place between the active conductors themselves (phase-to-phase and/or phase-to-neutral). This mode especially affects computers and electronic equipment. In a single protector. It follows that an installation comprising sensitive equipment cannot be protected efficiently with just one protective device or step. Two or more protectors are needed and must be coordinated. The first one (P1) must be installed at the main incomer and the rest (P2, P3, etc...) should be installed at the distribution panels of the most sensitive lines according to the Up (level of protection), always as close to the devices as possible. P1 is to be selected according to Iimp / Imax whereas secondary protectors must be chosen to assure the lowest Up. The rule to be followed in order to coordinate the operation of several protectors suggests leaving at least a 10 m distance between them. The reason being that electrical wires delay the current associated to the over voltage due to their inductive behavior. It is thus necessary to assure that P1 will have time to discharge the major part of the energy before the secondary protectors carry out their duty of reducing the residual voltage that the formers leave downstream. If two protection steps are installed in a single panel, coordination inductances must be used to obtain the same effect as a 10 m cable stretch. Does BSEN62305 take into consideration Photovoltaic Systems and should we protect them? The IEE Wiring Regulations (BS 7671:2008) are based on European Standards, which in turn are usually based on international standards. The UK participates in both European and international standards work. Two new areas of possible development within international standards are requirements for low voltage DC distribution (LVDC) and requirements for the integration of energy efficiency into IEC 60364. The rationale for LVDC distribution is that more and more electronic equipment is being introduced in buildings where DC is used. There is also a wide range of micro generation technologies – including solar photovoltaic (PV) and wind turbines – being installed which generate DC. One of the main reasons for the proposal to introduce LVDC distribution in a building is to improve energy efficiency by reducing losses in the conversion of AC to DC for electronic loads and conversion of the DC output from micro generation to AC for mains distribution. There are a number of challenges when designing a LVDC installation. Those involved in DC installations need to have the necessary expertise. Electrical equipment used on a DC installation must be suitable for direct voltage and direct current. For circuits operating at 230/400Vac it would be normal to use cables at 450/750Vac, and for domestic circuits operating at 230/400Vac, cable rated at 300/500Vac would often be used. The traditional rating of the cable 300/500V is the AC rating of the cable. The DC rating of this cable for core to earth is 300×1.5 (450V DC max) and the core to core voltage is 500×1.5 (750V DC max). Therefore, designers of DC installations need to give careful consideration to the selection of a cable for DC use to ensure that it is suitable for the operating voltage and they are recommended to seek advice from the manufacturer. Does a UPS need surge protection? When Does Poor Power Quality Cause Electronics Failures? To many of us, the utility power grid is a vast system of unknowns. Its performance can make unprotected electronic equipment useless. Why? Because grid voltage values, higher or lower than guaranteed nominal values, have an effect on electronic intelligence processing equipment. Incoming grid power “sees” the equipment's DC power supply, which bears the brunt of any AC grid voltage variation. Damaged computer equipment could be caused by poor quality power supplies or internally generated switching events. It is a common misconception that UPS systems do not need surge protection. We haven't got an FAQ on that. If you would like to call us, please feel free.